all passenger lines and stations. information on the dates of opening and closing of lines or sections of lines. This new 2019 edition contains details of the Mernda, Craigieburn and Sunbury extensions as well as the Regional Rail Link. 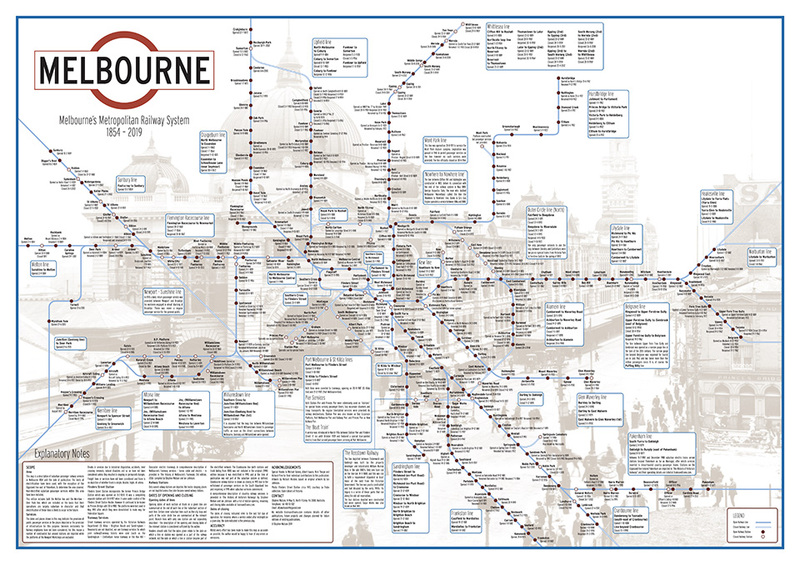 I have also included the Ballarat line as far as Melton due to its suburban character. Price per map is AUD $18.00 plus a flat rate of $12.00 postage in Australia for up to 10 maps. For orders of more than 10 maps postage is free of charge. Overseas customers will be charged postage at cost (again, postage for ten or more items is free) – Contact Steve for a price. If you already own a copy of one of the earlier editions (1st edition 1994, 2nd edition 1997, or 3rd edition 2004), I am offering a discount on purchases of the revised map. 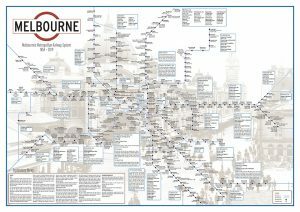 Contact Steve with a photo of your current map and with each purchase, receive one free copy of the Melbourne Train Map, Melbourne Tramways Map, Victorian Railways Map, Tasmanian Railways Map, and/or Sydney Train Map or a $9.00 discount on the purchase price. Just nominate your extra map(s) (or preference for a $9.00 cash refund) in the Order Notes on the Checkout page when you order. Applies to sales from this website only. Previous online purchasers (either via this website or eBay) do not need to provide evidence of prior purchase.